When I got my first spinning wheel way back in 2008 I had no idea that there were people out there who dyed and sold fibre for spinning. So a friend and I bought 10 kilos of combed top (prepared wool), we divided it up and did some dyeing. Then I discovered the very talented Carle at Nurturing Fibres and a lot of the fibre that I dyed sat unspun for years and years a little while. 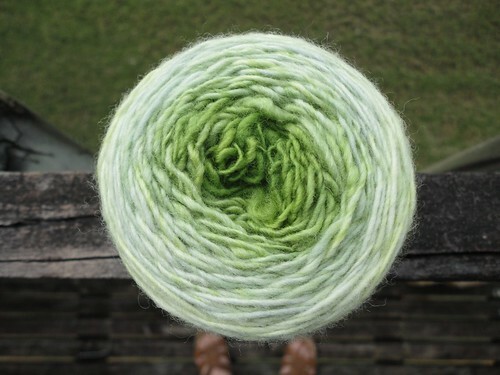 This year I’m working through my stash and that means that some of my early fibre has come to light. 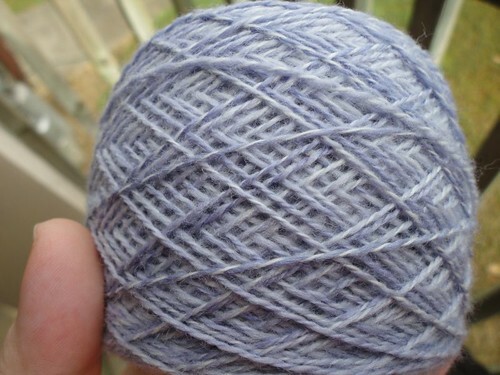 I recently spun this up – it’s superfine merino fibre I dyed myself. This is lace weight. 112 grams and 638 metres. I’m not sure what I’m going to make with this yet. While my stash of Nurturing Fibres fibre for spinning is running low. I do still have a massively overwhelming substantial stash of Nurturing Fibre yarns. It quickly became apparent that there was not enough merino single to finish the runway hat, so I pulled it out and started again with some Nurturing Fibre sock yarn. I’m glad I did, the colours are lovely. I’m heading to Perth in two weeks. My friends tell me it’s still quite cold there. 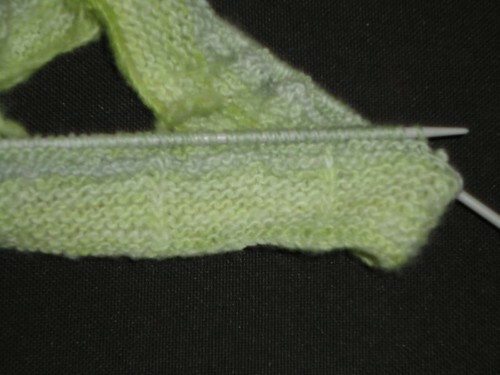 Given that their maximum temperature yesterday was 15 degrees C lower than here I’m going to feel cold anyway, so I’m hoping to have this finished so that I can wear it there. One thing about living in the tropics. and only visiting cooler places occasionally, is that Gorgeous Girl outgrows her winter clothes between visits. I was looking through her clothes yesterday and realised we are going to need to spend the first day in Perth buying her some long pants and some new sweaters and long sleeved shirts. I won’t be buying anything brand name or expensive as she’ll only wear them for two weeks and then they will sit in the drawer until our winter visit to Australia next year. My motivation to scrapbook is still MIA. However, September and October are the big birthday months in our house. It starts with brother-in-law 1 followed by Gorgeous Man, followed by brother-in-law 2 and brother-in law three. Then there is Gorgeous Girl, my brother, me, and a niece. 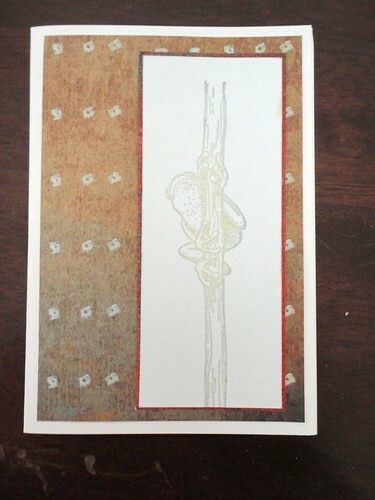 So in view of that I did make some cards. I’ve bought this tag as part of a set when I visited the USA in 2010, guess it’s finally time for it to be used. 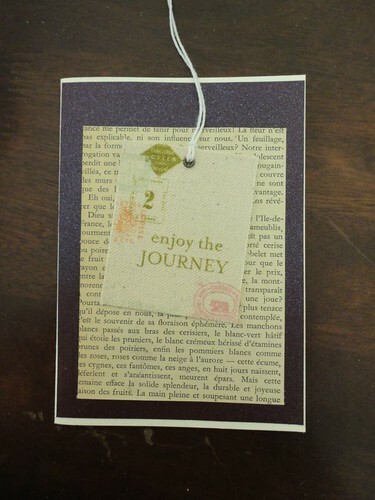 The french background came from the care package sent to me by Kate. 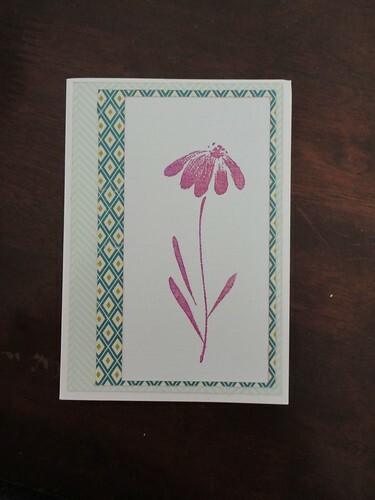 Next up this cute little flower card. I know what I’d do differently next time, but I think they work in a quirky kind of way. 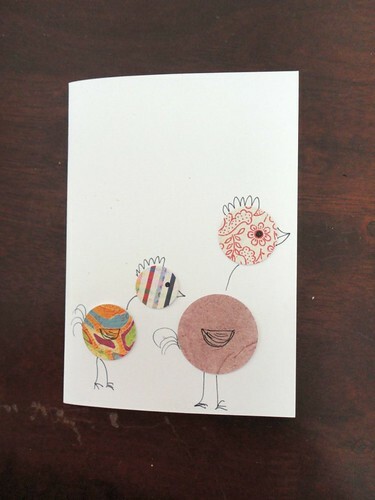 The house got a bit of a spring clean this morning, so I’m hoping to spend much of today with the sewing machine. 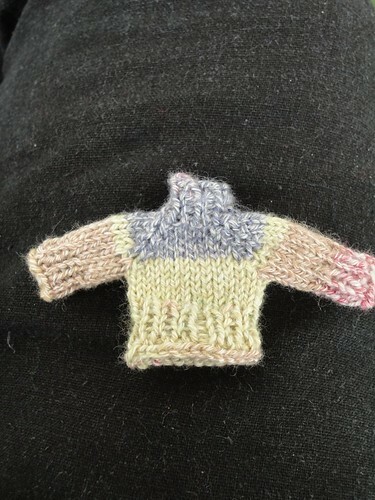 Last week I was gifted a pattern in a RAK (random act of kindness) from one of my Ravelry friends. The pattern in Runway by the very talented Woolly Wormhead. 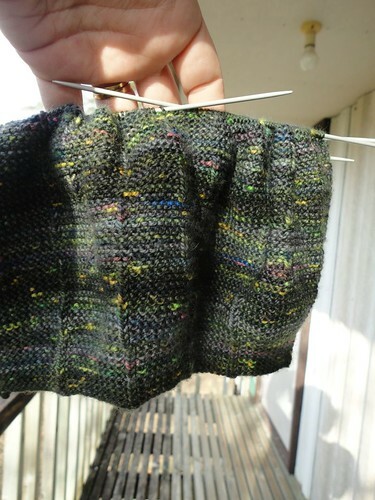 There is a Knit along happening for the pattern, and since I had nothing on the needles I decided to cast on last night. I cast on with this yarn. 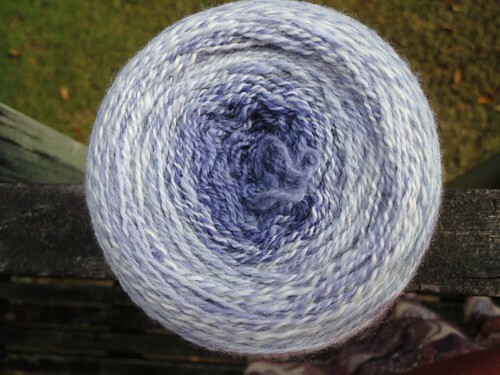 Handspun singles. This is how much I’ve done so far. 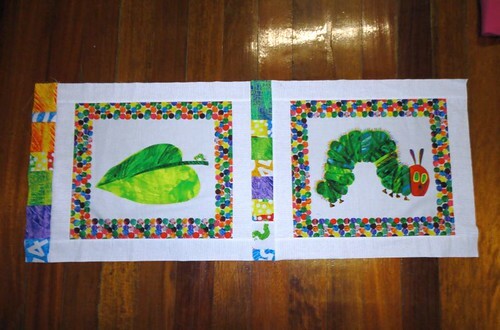 On the agenda after Gorgeous Girl goes to bed tonight is spending some time on her very hungry caterpillar quilt. Gorgeous Girl’s school employs security guards. They watch the car park and help guide cars during drop off and pick up times. Others patrol the grounds of the school at night, they monitor entrance to the school during the day and accompany the children and teachers when they go on excursion. Today I was very grateful for the security guards. About halfway to school the car started making a terrible noise. There was no safe place to stop, so I babied the car along to the school hoping that whatever it was wasn’t too serious. In the car park I got down on my hands and knees and discovered a stick wedged in the wheel well. It had been dragging on the road making the noise. I tried to pull it out myself, but didn’t have the strength. Fortunately the security guards managed to remove it for me (along with lots of advice from some of the fathers who were picking up their kids) and Gorgeous Girl and I were able to drive home without sounding like the car was falling apart. 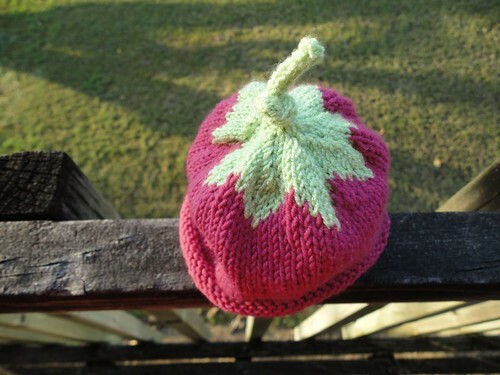 I finished this little hat last night. I think it’s ridiculously cute. The green is a little bit brighter in real life – late afternoon sun washed the colour out a little. Green is more accurate here. I’m very proud of myself that the tension is even where I had to carry the yarn along the back and that you can’t see it from the right side of the work. But the pink is off. Don’t you just love the little leaves. I can see a few more of these in my future. 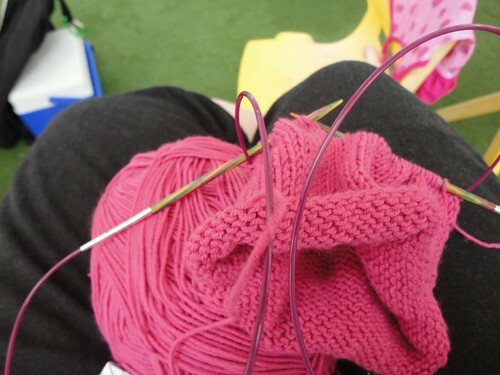 It only used 18 grams of the pink yarn and even less of the green, so it’s a great scrap buster. I have tentatively earmarked this for someone I know. If they have a girl it will go their way, if not then I’ll donate it to charity. 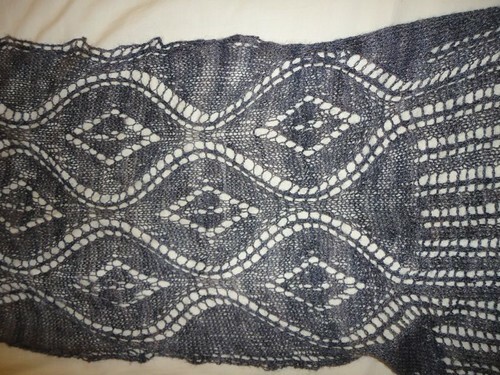 I finally got seascape stole blocked, and only lost 2 pins which went rusty while the blocking was done. I need a better blocking system. The edges are very wavy. Yarn is handspun by me. 80% merino and 20% silk. Of course it’s far to hot to wear it here. I’ll throw it in my bag and hope for cool weather when I visit Perth in September. There has been knitting. I knitted two jumpers (sweaters) this week. These are about an inch and a half high. Today we took Gorgeous Girl to one of our favourite places. We try to get here about every 6 or 7 weeks. There’s a kids’ play area at one of the fancy hotels. There’s a pool that is just the right depth. A rock climbing wall, flying fox and other assorted things. 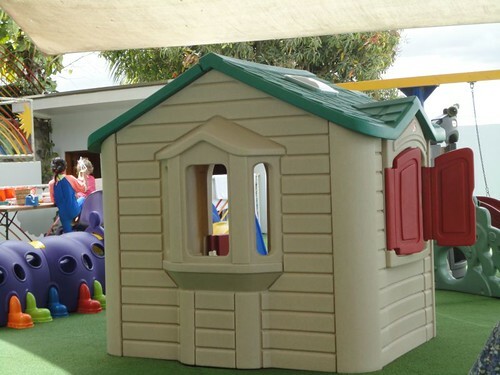 A cubby house, and today there was a craft table. It’s all in the shade, which for someone like me, who has ten minutes in the sun before starting to burn, is a real bonus. 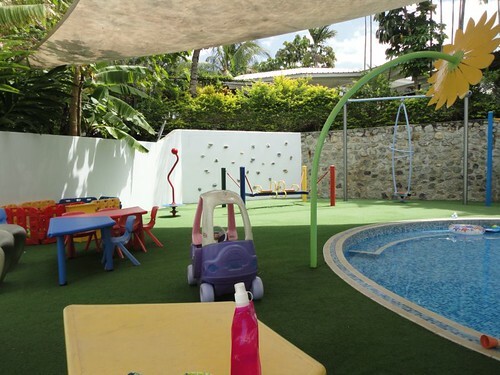 You pay a fee to enter and can also order from the hotel restaurants and it’s delivered to the kids’ area. It’s all very civilised and relaxing, and Gorgeous Girl just loves it. until I got to the point where I needed the pattern. 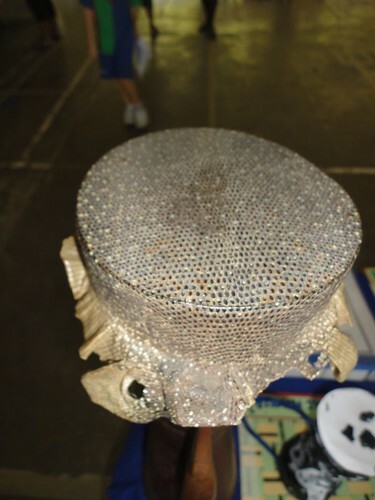 (This has a fancy finish to the hat). 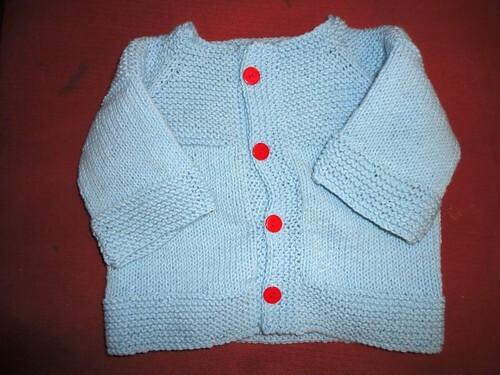 I finally sewed the buttons on this little cardigan. It’s going to be donated to charity. The button band is straight really. I just downloaded the wrong photo from the camera. 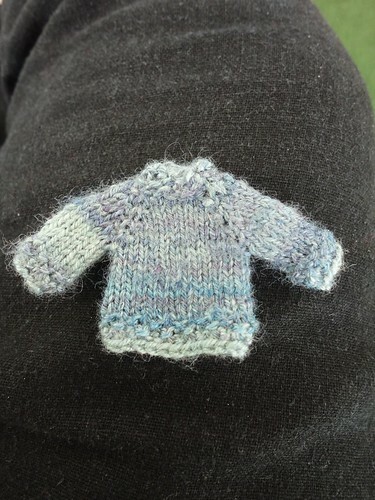 The pattern is garter yoke baby cardi. 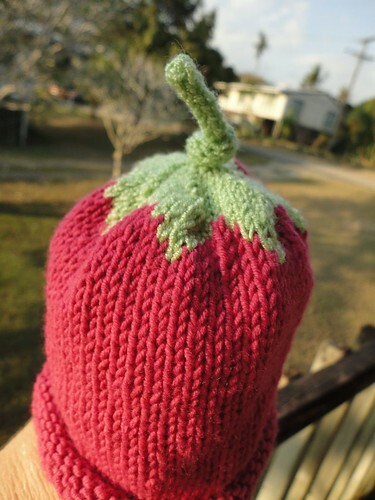 Also found here, if you are not on Ravelry. 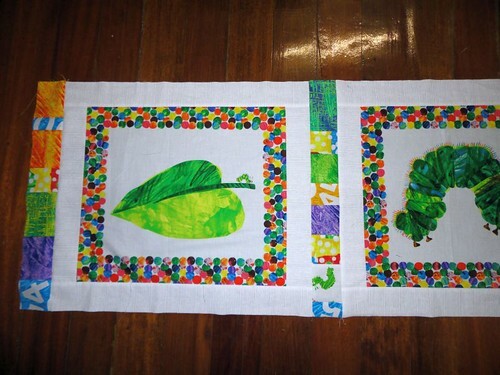 I’ve been sneaking a few minutes here and there to work on Gorgeous Girl’s Very Hungry Caterpillar quilt. The white is the quilting cotton I found in a store here in PNG (very excited about that because I didn’t have enough white in my stash to do what I wanted). 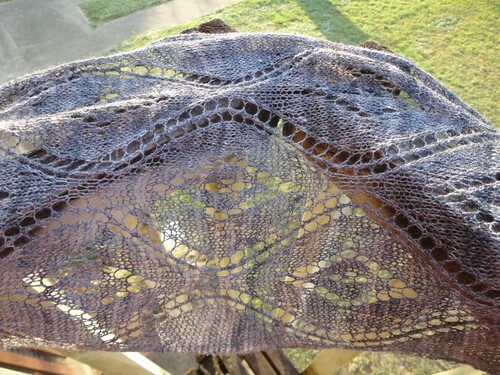 I had originally planned to use the dots as sashing between the white, but I don’t have enough in the stash and this year is really about using what I have (plus I don’t want to wait until my next trip to Australia to get more of it). So I improvised by cutting fabric I did have into random lengths and making a pieced sashing. I also tried to be as random as possible when sewing it together, only proviso that two of the same fabric couldn’t sit next to each other. I think it will work. What do you think? 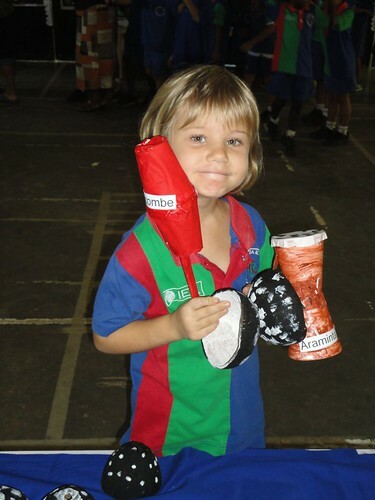 The theme for this term at Gorgeous Girl’s school is “Our Culture”. 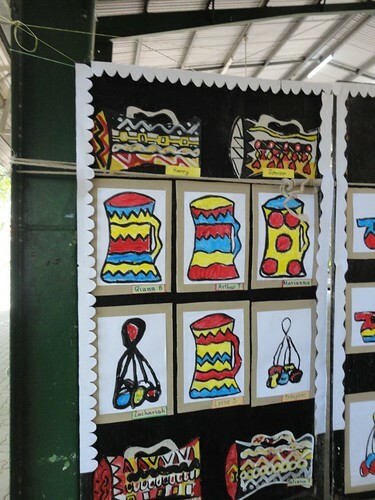 Last week there was an exhibition for the parents to see what the children have been doing. They have been making traditional musical instruments. 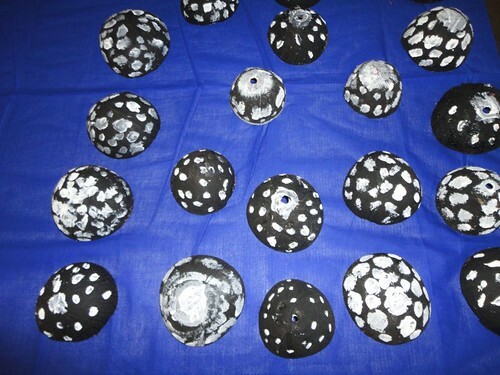 These are decorated coconut shells. Gorgeous Girl showed us how to bang the two rounded ends together while doing a dance. 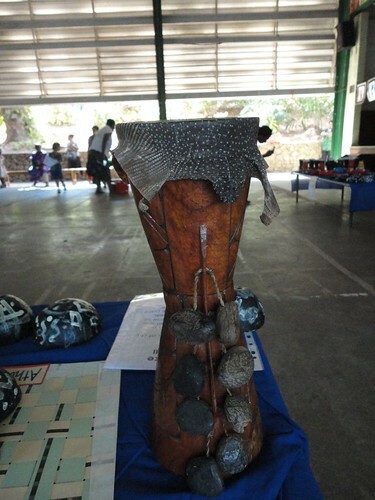 They also made their own versions of this type of drum. I’m pretty sure that the top is made of monitor skin. 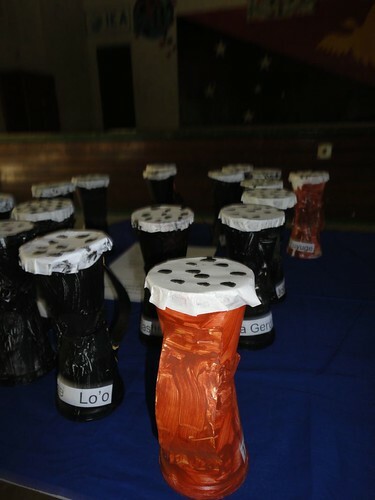 This is the kids’ versions made by Gorgeous Girl’s class. 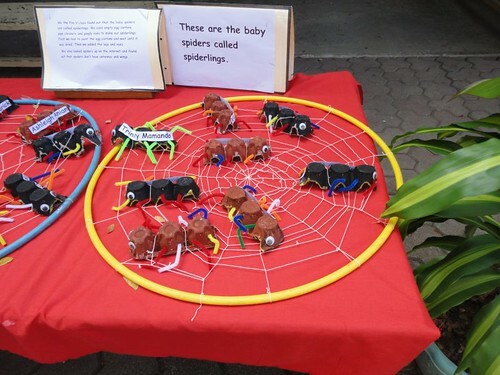 Lastly, science this term has been on spiders, I thought these were kind of cool. I know this is a craft blog, but I hope you’ll find this little insight into school in Papua New Guinea interesting.